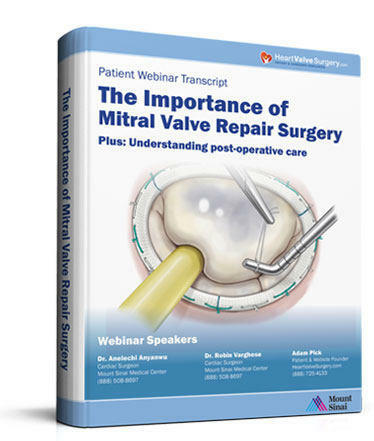 Our recent webinar, “The Importance of Mitral Valve Repair Surgery”, went really well. Over 140 patients and caregivers registered to learn critical insights about mitral valve disease and treatment from Dr. Anelechi Anyanwu and Dr. Robin Varghese, cardiac surgeons at Mount Sinai Hospital. In particular, the webinar focused on the advantages of mitral valve repair surgery for patients. Download the free, 54-page eBook transcript of the webinar, by clicking here. Watch a video playback of the webinar, by clicking here. On behalf of our community, I want to thank Drs. Anyanwu and Varghese for participating in this special event about mitral valve repair surgery. I also want to thank Gideon Sims, Flo Kelemen, Tarik Najedinne at Mount Sinai for coordinating and supporting this webinar. Lastly, I want to thank all the patients and caregivers who attended this very interactive webinar. The “Q&A” section of the webinar was really educational!! !